For my daughters "pop star" birthday party, we made these cute looking treats. 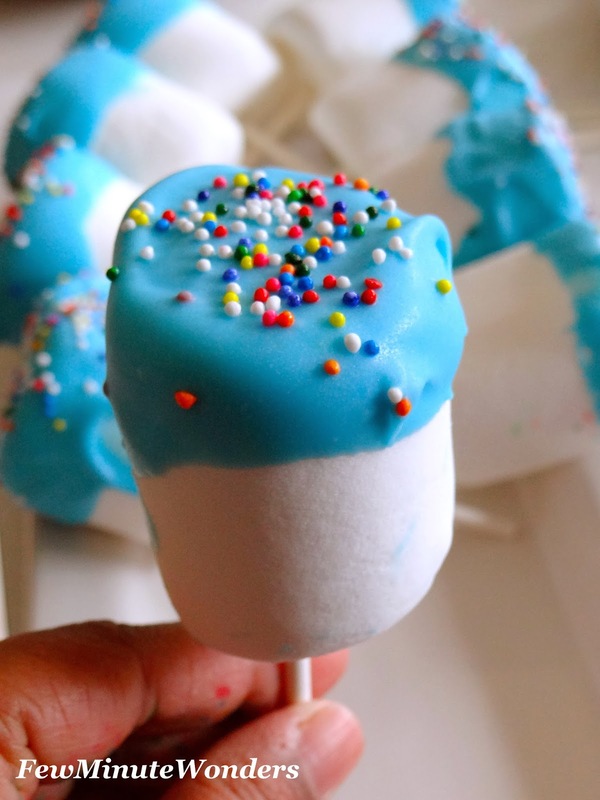 To go with the theme, we made pops with marshmallows which was a super hit. All I remember was placing the tray filled with marshmallow pops and they were gone in a jiffy. There were great demands for seconds and some kids got lucky. I know its not the most healthy treat, but as my daughter puts it " we need to enjoy things we don't during normal days". It is such a breeze to make them. It took us less than 10 minutes to make some but they needed fridge time before they could be served. Here is an awesome treat to serve any time. Normally I would like to make them with chocolate instead of the candy melts, but my daughter insisted that she wanted it to be blue. So we let the birthday girl have her way. 1. Melt the candy melts in a microwave safe bowl as per instructions. 2. 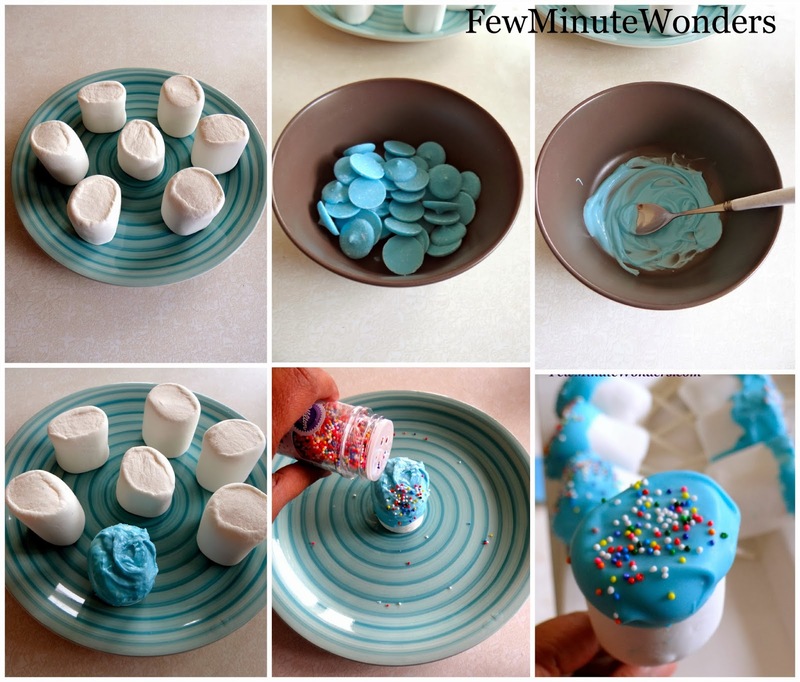 Take each jumbo marshmallow and dunk them partially so that half of the marshmallow is covered with the candy. 3. Add the sprinkles over the candy melts, place them back on the plate and keep them in the fridge until the candy melts set well. 4. 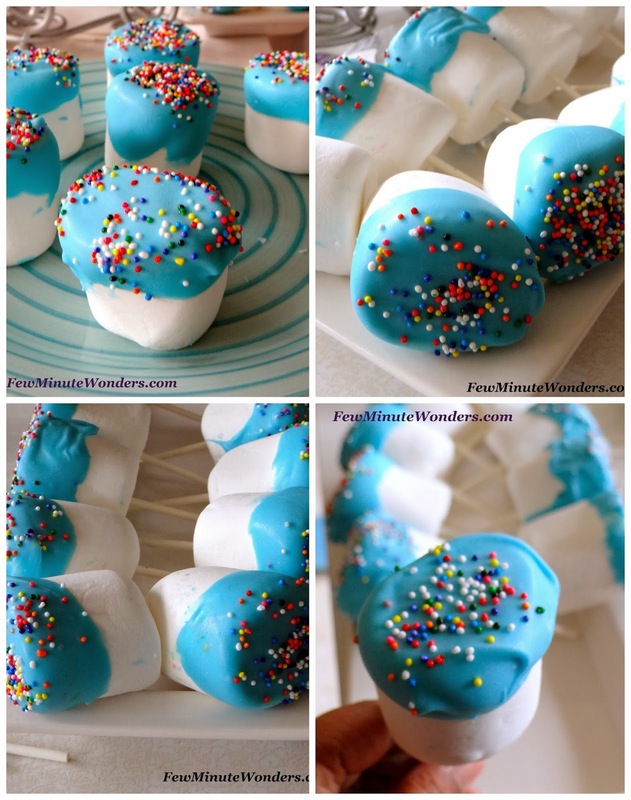 Take the popsicle and insert it in the marshmallow and place them in a tray serve. Damn cute marshmallow pops, seems ur daughter had a blasting party..Well done.